Secondary metabolites are compounds produced by an organism that are not required for primary metabolic processes, and in general, their absence does not result in immediate death of the organism. However, these metabolites may have significant effects on other organisms, for example, by acting as toxins. Secondary metabolites are produced by a wide range of microorganisms, including many species of bacteria and fungi, and include several that may be considered as candidate participants in interkingdom signaling. Many phenazines are produced by bacteria including Pseudomonas and Streptomyces spp. Phenazines are synthesized via the shikimic acid biosynthesis pathway subsequent to chorismic acid. Subsequent modifications lead to a variety of phenazines with differing biological activities. Phenazines are commonly pigmented and have antibacterial activities, however several phenazines also have negative effects on host cells and are considered virulence factors. The prototypical example is the pyocyanin phenazine (1-hydroxy-5-methylphenazine) produced by more than half of all P. aeruginosa clinical isolates. Pyocyanin can be detected in the sputa of patients with P. aeruginosa lung infections at concentrations up to 100 mM (Wilson et al. 1988). Pyocyanin was first extracted in 1860 from wound dressings (Fordos 1860). At neutral pH, pyocyanin has an intense blue color and is responsible for the "green urine" and blue-tinted skin that some P. aeruginosa infected patients display (Silvestre and Betlloch 1999). Pyocyanin is involved in redox cycling in bacteria and mammalian liver and epithelial cells. The generation of free-radicals is thought to contribute to its antibacterial properties and it is these reactive oxygen species that mediate many of the effects on host cells as well (Miller et al. 1987; Gardner 1996). The described effects of pyocyanin and its phenazine precursor, phenazine-1-carboxylic acid, are diverse and may affect many different types of cells and potentially contribute to the inflammation and subsequent tissue destruction characteristic of P. aeruginosa infections. These effects include the inhibition of human cell respiration, ciliary function and growth of epithelial cells (Sorensen and Klinger 1987; Wilson et al. 1988; Kanthakumar et al. 1993), inhibition of prostacyclin release from lung endothelial cells (Kamath et al. 1995), induction of neutrophil apoptosis (Usher et al. 2002; Allen et al. 2005), induction of chemokines and adhesion molecules (Look et al. 2005), disruption of calcium homeostasis (Denning et al. 1998), and inactivation of human vacuolar ATPases in human airway epithelial cells (Ran et al. 2003). Secondary metabolites synthesized by bacteria have primarily been studied and exploited for their antibiotic potential. In fact, over two-thirds of the antibiotics currently in use clinically are produced by Streptomyces spp. (Watve et al. 2001). However, the interkingdom signaling potential of secondary metabolites is now becoming a popular area of study. One very interesting example is the polyketide secondary metabolite 3,5-dihydroxy-4-isopropylstilbene (ST), produced by Photorhabdus luminescens. Photorhabdus is an insect pathogen that also exists in a mutualistic relationship with nematodes (Joyce et al. 2008). Photorhabdus colonizes the gut of the juvenile nematode, which lives in the soil and preys on insect larvae. Once the worm finds its larvae prey, it invades and migrates to the insect's hemolymph (combined blood and lymph), where it regurgitates Photorhabdus. The bacteria grow quickly and kill the insect within 72 h, after which the nema-todes feed and undergo several rounds of reproduction within the cadaver (Joyce et al. 2008). In response to environmental cues, the new juvenile nematodes will emerge from the cadavers carrying Photorhabdus in their guts to find new larvae and begin the cycle again. Photorhabdus ST, which is chemically similar to the plant antioxidant compound resveratol (see Table 14.1), has antibiotic activity and may serve to protect the nematode and its insect cadaver from intruding microbes in the soil (Hu and Webster 2000). 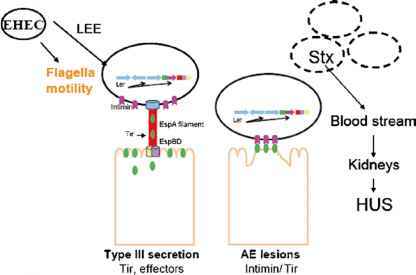 However, ST also acts as a virulence factor by inhibiting components of the insect's innate immune response (Eleftherianos et al. 2007). Most interestingly, there is now evidence that Photorhabdus ST is an interkingdom signal that is important for the normal reproductive development of its nematode host (Joyce et al. 2008). The transformation of juvenile nematodes into self-fertilizing hermaphrodites requires an environmental cue(s) from the infected insect hemolymph. The ability of the nematodes to undergo normal reproductive development can be distinguished experimentally by determining the postinfection recovery of juveniles, which then develop into hermaphrodites. Nematodes infected with mutant Photorhabdus, not able to synthesize ST, displayed recovery rates 5-15% of those infected with ST-producing Photorhabdus (Joyce et al. 2008), indicating that ST is a versatile chemical with important roles in pathogenicity and mutualism. The fungi make and excrete a wide array of secondary metabolites, many of which act as toxins to their mammalian hosts. These secondary metabolites are synthesized in a number of different biosynthetic pathways (Table 14.1). The polyketide metabolites are the products of polymerized acetate, resulting in a fatty acid or a polyketide. Processing of the fatty acid chain by cyclization, lactonization, or formation of thioesters or amides, results in a huge number of possible structures. Polyketide secondary metabolites include orsellinic acid, tetrahydroxynaphthalene (precursor for melanin), statins, fumonisin, and the aflatoxins, which are some of the most toxic compounds on earth. The function of aflatoxins in fungi is unknown however, after consumption of plant material contaminated by Aspergillus spp, toxicosis followed by death can occur in even large animals by almost undetectable quantities. Species' susceptibility varies greatly; however, the liver is the primary target, where cytochrome P450 enzymes convert aflatoxins to the reactive 8,9-epoxide form (Mishra and Das 2003). The reactive aflatoxin epoxide then binds to eukary-otic DNA and proteins, specifically the N7 position of guanines. Aflatoxin-DNA adducts can result in GC to TA transversions, and it's carcinogenic potency is highly correlated with the extent of aflatoxin-DNA adducts formed in vivo (Bennett and Klich 2003). While aflatoxin appears to affect hosts by a nonspecific mechanism, other mycotoxins exert their function by interacting with specific host endocrine receptors (see below). Fig. 14.2 Zearalenone is produced by the fungus Fusarium roseum, which grows on grain commonly used to feed livestock. Once consumed, it is bioconverted to primarily alpha-zearelenol in humans and swine or beta-zearalenol in cattle, by 3a and 3^-hydroxysteroid hydrogenase, respectively. Zearalenone and its metabolites disrupt reproductive processes by mimicking estradiol-17b and binding to estrogen receptors. 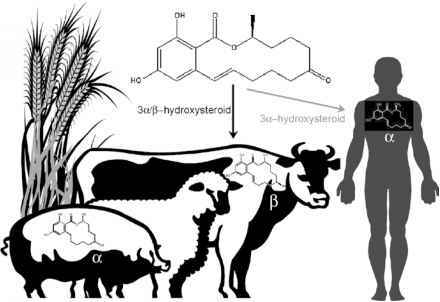 The most notable effects of zearalenone are premature mammae development and other estrogenic effects in young female animals and humans both the a and b enzyme isoforms (Malekinejad et al. 2006). This could potentially explain the species-related differences in ZEA metabolism and sensitivity. ZEA and its metabolites, a and b-ZEA disrupt reproductive processes because they mimic estradiol-17b action by binding to estrogen receptors in target cells exerting estrogenic action (Diekman and Green 1992; Nagel et al. 1998; Shier et al. 2001). Furthermore, unlike endogenous hormones, ZEA metabolites tend not to bind carrier proteins (Nagel et al. 1998), allowing easier access to estrogen target sites and a potential increased potency. In 1989, an increased incidence of early breast development in young Hungarian girls was associated with exposure to ZEA (Szuets et al. 1997). Researchers detected patients with serum ZEA levels of 18.9-103 mg/L and suggested that contamination of foodstuffs with ZEA caused early maturation. ZEA was also cited as a possible causative agent for an epidemic of precocious puberty in Puerto Rico from 1978 to 1984 (Schoental 1983). Recently, researchers at the University of Pisa in Italy analyzed the serum of girls affected by central precocious puberty syndrome and serum from healthy female controls to evaluate whether mycotoxin exposure was a triggering factor for premature sexual development (Massart et al. 2008). They discovered a higher growth rate among girls who tested positive for serum ZEA and/or its metabolite a-zearalenol, and suggested possible correlations between environmental mycoestrogen exposure, precocious puberty, and anabolic growth effects of mycotoxins in exposed girls (Massart et al. 2008). Secondary metabolites produced via the amino acid pathway are most noted for their antibacterial activities. The b lactam antibiotics, penicillin and cephalosporin, are produced by some Ascomycota spp. of fungi and many bacteria, while the antibiotic peptide defensins, produced mainly by vertebrate and invertebrate hosts, are also synthesized by the amino acid pathway. However, some toxins derived from amino acid synthesis affect the mammalian endocrine system by acting as agonists of the mammalian 5-HT2A receptor, which is a subtype of the 5-HT2 receptor belonging to the serotonin receptor family. One example of these is psilocybin, an indole produced by hundreds of species of fungi (often called "magic mushrooms"), including those of the genus Psilocybe. Psilocybin is rapidly absorbed through the lining of the mouth and stomach, and is dephosphorylated to psilocin in acidic conditions (Sard et al. 2005). Psilocin travels through the blood to the brain and binds to 5-HT2A receptors, causing nerve impulse effects, hallucinations, and other "psychedelic" effects (Sard et al. 2005). The alkaloids are a broad category of chemicals produced by fungi that are synthesized from several different pathways. Many of these chemicals are thought to be involved in defense and disrupt metabolic processes in herbivores that eat infected grasses, or deter attacking insects. The ergot alkaloids are a collection of alkaloid compounds based on lysergic acid amide, which are produced by fungi in the genus Claviceps (Bacon et al. 1986). There are about 50 known species of Claviceps, commonly called the ergots, most living in tropical regions. The ergots infect many grasses, including rye, wheat, and barley as part of their life cycle. The fungi are endophytic and cause no known disease symptoms in their hosts. However, the alkaloids produced by the ergots can induce various metabolic disorders in the herbivores that consume infected grasses. For example, one of these alkaloids, ergotamine, possesses structural similarity to several neutotransmitters including serotonin, dopamine, and epinephrine (Tfelt-Hansen et al. 2000). It acts as both an agonist and antagonist to several mammalian receptors including 5-HT1B/1D, dopamine, and norepinephrine receptors (Tfelt-Hansen et al. 2000). 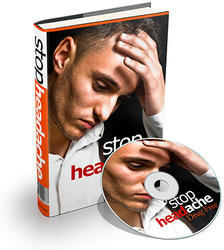 Ergotamine is used medicinally to treat migraine headaches because it causes constriction of the intercranial extracerebral blood vessels (Tfelt-Hansen and Koehler 2008). It is also used to induce childbirth and prevent postpartum hemorrhage (Akins 1994). In addition to ergotamine, other alkaloids produced by fungi, such as paxilline and loline, reduce the feeding and reproductive rates of insects (Schardl et al. 2007).